If you love this square pattern… Save it to your Ravelry favorites!! Click Here…. I am in love with these fall colors and fun textural stitching… This Festival of Fall Square is a great pattern to make an afghan, pillow or even a chair cover with!! I can’t wait to see all of the projects you come up with!! Post Stitch Decrease ~ Yo, insert hook around next st, yo, pull up loop, yo, draw through 2 loops on hook, yo, insert in next st, yo, pull up loop, yo, draw through 2 loops on hook, yo, insert hook around next st, yo, pull up loop, yo, draw through 2 loops on hook, yo, draw through all 4 loops on hook. Popcorn Stitch (3 dc version) ~ Make 3 dc in indicated st, remove loop from hook, insert hook in 1st dc, replace loop back on hook and draw yarn through both loops. 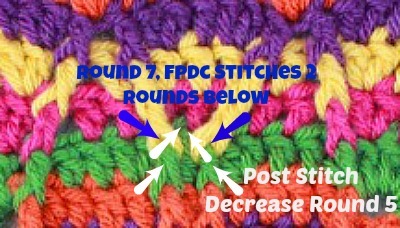 Round 4: Join yarn in any ch-1 sp, ch 3(counts as dc), fpdc around next st, *dc in next 4 sts, (fpdc, ch 1, fpdc) around next st, dc in next 4 sts, fpdc around next st^, dc in next ch-1 sp, fpdc around next st*, repeat *to* 3 more times, ending at ^ .join to to of beginning. Finish off. = 52 sts, 4 ch-1 sp. Now available in a French Translation!! Congratulations!!!! 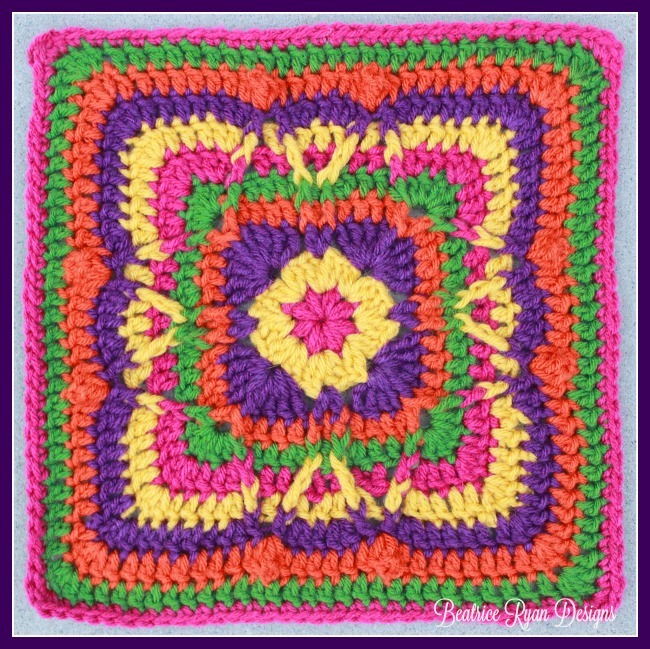 You now have your first Festival of Fall Square… I hope you love this free pattern and will make a beautiful afghan with this design!! Please post you finished pictures on my Facebook page for everyone to see!! Thank you so much for sharing your pattern! And it’s named for my favorite time of the year…bonus!! Oh that’s lovely….when it’s complet wharfs the size please?